This was the biggest event that I have ever participated with. 1500 reenactors from all over the world. Many from Canada, France, and Germany. A huge event that took 16 months of planning and work, and it paid off. 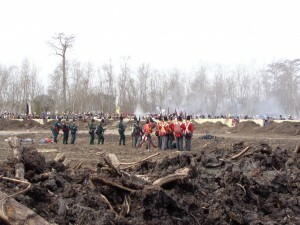 This was the biggest event to commemorate the War of 1812 since the War of 1812, and there will probably not be another like it in my lifetime. Pretty good for a war that is little understood, and a major battle that is misunderstood! No, it did not matter that the Treaty of Ghent was signed before the final battle of New Orleans. And the Battle was not one fight, but a six month campaign for control of the Gulf and Mississippi. The treaty had not been ratified, and the governments would have to exchange signed copies of the ratified treaty to make it official. That would not happen until over a month later, in February 1815. If the US had lost New Orleans, it is very possible that the Treaty would not have been ratified, and the US would not get back the Louisiana Purchase territory. This event had something for everyone. Portrayals were of British infantry, Highlanders, Riflemen, and mounted officers. US infantry, Artillery, and state soldiers who joined the 7th Infantry. State militias from Louisiana, Kentucky, and Tennessee, all with their interesting and varied outfits; especially the French from New Orleans. 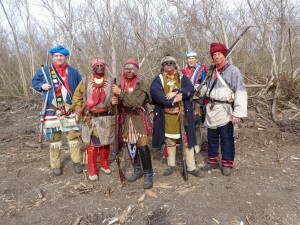 The Baratarian pirates, the Choctaw scouts, and the Free Men of Color. And it was a family affair because the woman and children were also well occupied. The weather was cold the first few days, with mornings in the 20s. But the rain held off until Sunday afternoon and did not dampen the event, and especially not the battle reenactments, which we gave a big sigh of relief! The field had only been cleared before our event. (Not our fault; we would have preferred it done months earlier.) It would have gotten really ugly if we got another gully washer of a rainstorm that cancelled the last day of the event the previous year. You would think that this even would include much revelry in the French Quarter. During the week, I went to two formal dinners and one informal gathering along the immoral fester known as Bourbon Street, and that was it. Most of the time, by the end of the day, my feet were killing me and sore from the arthritis, so I had to get rejuvenated by a soak in the tub in the hotel. I would not have survived otherwise. 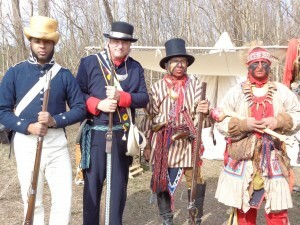 We had a small contingent of reenactors portraying the Choctaw regiment, numbering from 6 to 12 during the week. My Florida brothers were much impressed with the size of the event, and were probably delightfully surprised by how much activities went on. But glad they did not have to attend all the formations and parades. Pedro and his family, Mike Manzano, Jimmy Sawgrass, Swamp Owl, and Bearheart and his family, all looked great and did a wonderful job. Yes, it was very cold for us Florida boys, but the positive point was that we got to show off our regalia. I think that one morning, Sawgrass had on all his outfits, and was layered up by about six shirts and coats! I had tea at the British Consulate and enjoyed a number of museums in town before the main event. 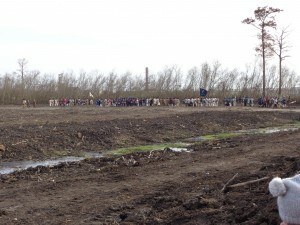 Thursday, January 8th, was the actual 200th anniversary of the final Battle of New Orleans. So we had a ceremony at the national park. If we knew that would mean us standing out in freezing weather around 25 degrees and strong wind for several hours in formation, with dull speeches and singing that sounded like someone strangling cats, we would have stayed in the hotel. I don’t think that we will volunteer to do that again. I do these events to interpret, not to be just decoration. So Friday to Sunday was the main event at our battlefield park. And this was our park, and not a state or national park. Since you cannot have a battle of two opposing forces firing at each other in national parks, we decided to make our own event and reenactment park. 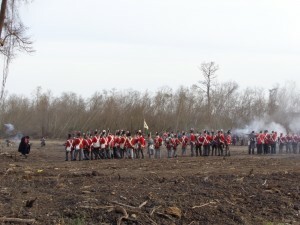 A local foundation procured the land along with the Louisiana Living History Foundation, and the Seventh U.S. Infantry Living History Association. So this made it really special, because it was our event, ran how we wanted it, and we did what we wanted. This is the only way living history will survive, because the state and federal parks are failing so badly with living history and interpretation these days. We had the best encampment and the best sutler row I have seen in a long time. We were not forced to just stand there as window dressing like at the national park. People could visit and talk to us, and we had a really fun time. 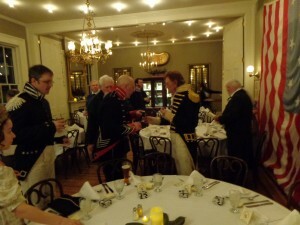 And we had five great battle reenactments from Friday night to Sunday morning. This way, there was something for everyone. Before and after the event during the week, the local PBS station, WYES, played a documentary they had made with cooperation with the 7th and the Louisiana Living History Foundation; “The Battle of New Orleans: A Meaningful Victory.” This was a very good documentary that was very comprehensive and covered much of the New Orleans campaign, including the Fort Bowyer battles. Since we have been doing this for many years, we know a good film when we see one, and this was good. There were others who attempted films who are not even worth bothering. And before the event was over, the local paper told of film producers coming out of the woodwork dropping celebrity names. Which is a good indication that you need to ignore those crews. Another bad sign with this group of would-be producers, is that they start right off the bat with the wrong information, which tells me that they have not even looked at the real history. But finally, we got a good event and did what we wanted. And the local PBS station did a good documentary.